For much of the year, the painted terrapin’s name doesn’t make much sense. 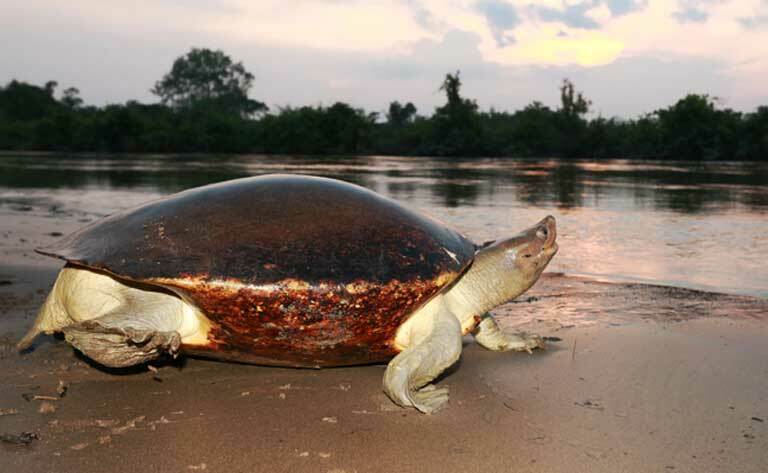 The carapace of this large Asian river turtle is usually an unremarkable grey/brown. But during the breeding season, the male undergoes a stunning transformation. Its shell lightens in color to boldly show off flashy black markings. As if that weren’t enough to entice the ladies, its head turns pure white and a stunning red strip develops between his eyes — turning it into one of the most strikingly and uniquely beautiful turtles, says the Turtle Survival Coalition, which ranks the painted terrapin among the 25 most endangered tortoises and freshwater turtles on earth. When Joko Guntoro sees those bright hues, he thinks of the similarly colored Indonesian flag and his country’s extraordinary biodiversity. Guntoro is the founder and program director of the Satucita Foundation, a small, grassroots organization working to save the painted terrapin in what is likely its last major Indonesian stronghold — an area within the northwestern tip of Sumatra called Aceh Tamiang, a regency of 1,939 square kilometers (1,205 square miles). 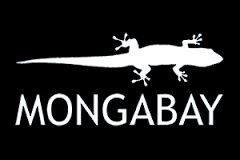 His foundation is currently preparing for the historic release of hundreds of hatchlings into the wild. 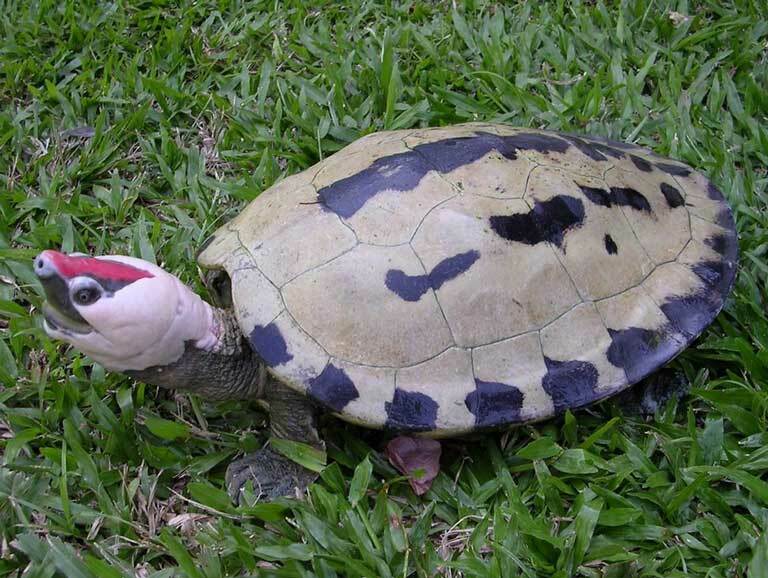 Back in 2009, no one was even sure if any painted terrapins (Batagur borneoensis) were left in Aceh Tamiang. 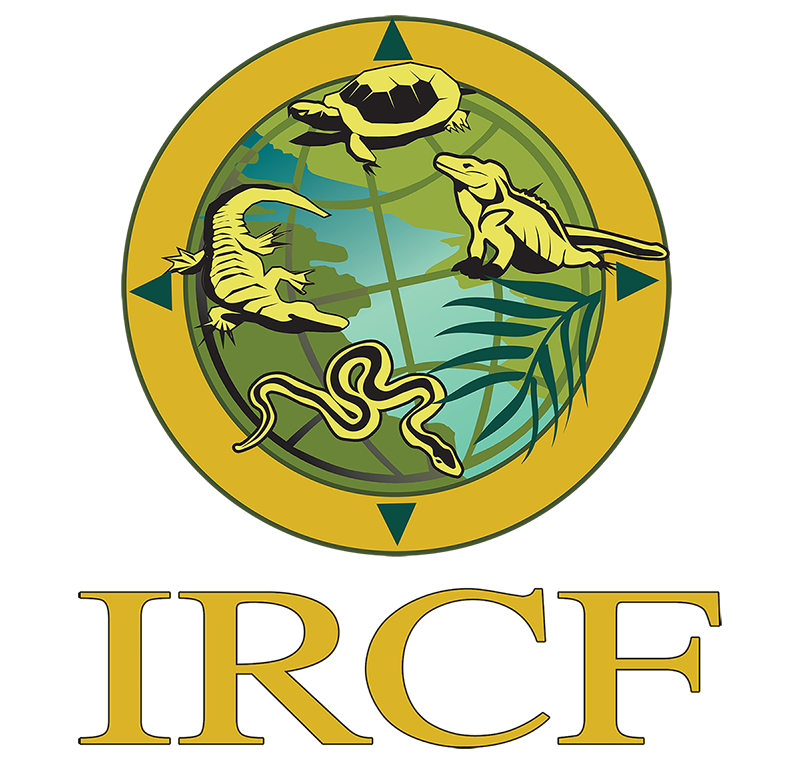 At that point, the IUCN had already been listing the species as Critically Endangered for thirteen years. So Guntoro went looking for the animals on nesting beaches and in fishermen’s nets. His almost yearlong survey found just nine adults. 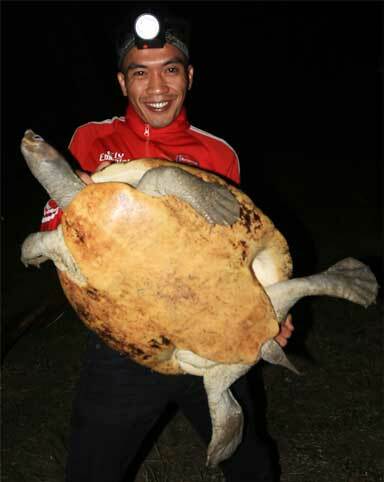 Indonesia’s painted terrapins, he discovered, had fallen victim to the all too familiar litany of assaults that the species has met throughout its historic range, which includes Malaysia, Brunei and Thailand, where it’s now extinct. 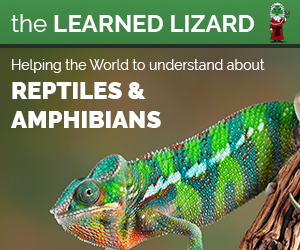 Like chelonians the world over, its meat and eggs are delicious, and its beauty is much valued by the pet trade, while its habitat is rapidly vanishing. Though females nest on ocean front beaches, the painted terrapin does most of its living in mangrove forests and river estuaries. That’s where it finds logs to bask on. And that’s where it plucks up riparian vegetation that falls like manna-from-heaven into the water. Hence the upturned snout that makes eating at the surface easier. But Aceh’s mangrove forests have been logged for charcoal production or converted into oil palm plantations. 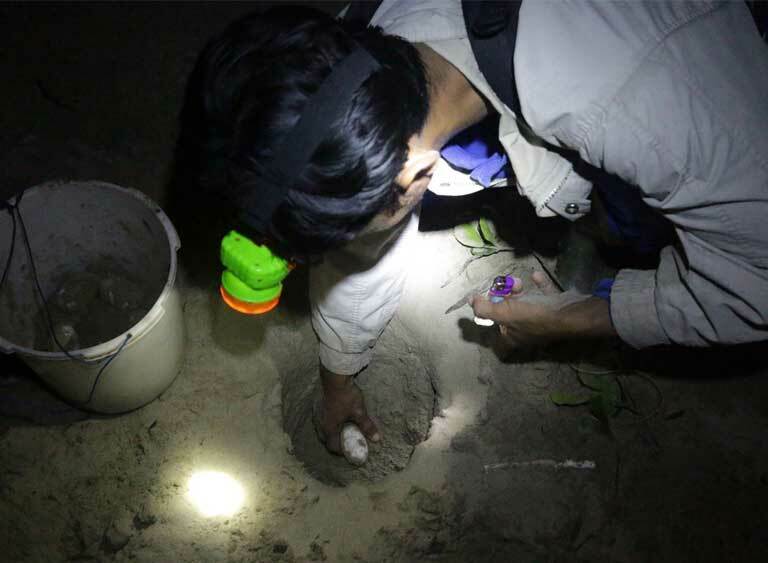 And on the nesting beaches that the painted terrapin shares with sea turtles, its offspring (laid in small clutches of about 10 to 12 eggs) are particularly vulnerable to an age-old, albeit now illegal, tradition and trade. Initially, his efforts were simple and low tech. He gathered a few dozen eggs — most purchased from fishermen — and incubated them in sand-filled Styrofoam boxes indoors at a nearby house to prevent predation. Only ten eggs hatched that first year. Then, in 2011, with funding from TSA, the Satucita Foundation built a basic head starting facility to incubate eggs and raise hatchlings. Once the young terrapins grew to about 5 inches, they were released. These liberation ceremonies were conduced with lots of fanfare and flare. Everyone came out to see the small hatchlings scurry into the water: the chief of police and local military commander, Boy Scout troops and villagers. But this basic incubate-and-release strategy had only a minimum of success. 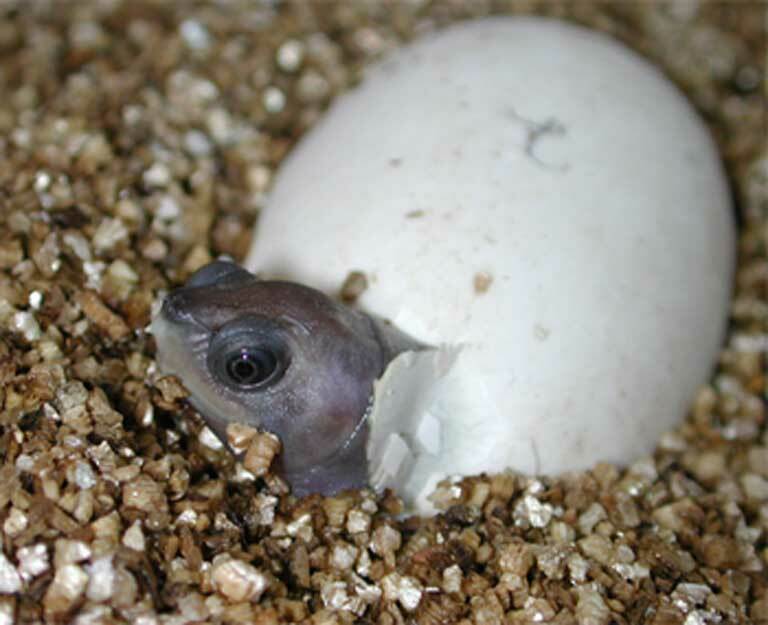 In total, only about 300 hatchlings have been released so far, and last year only 10 percent of the eggs collected hatched. Dr. Gerardo Garcia, the Curator of Lower Vertebrates and Invertebrates at the U.K’s Chester Zoo, has a theory about that low hatchling rate. He says that the incubation facility — 12 miles from the nesting beaches — is far from ideal. He’s referring to a new strategy that the Satucita Foundation is trying this year, based on guidance from Garcia and Hudson. 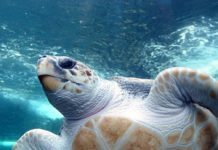 Bolstered by funding from the Chester, UK and Houston, TX Zoos, as well as the TSA, the foundation has been able to pay for 24/7 patrols on two oceanfront nesting beaches. No easy task: the security squad has to haul all of its food, water and supplies to the remote nesting beaches. A new team rotates in every two weeks. During the five-month long operation, even Guntoro takes his turn as a guard. The team patrols just after dark and before dawn, walking over seven miles each night. When they find a new clutch, the terrapin squad carefully reburies the eggs in a fenced off area on the same beach. That protects them from wild boars out looking for an easy meal. Fishermen out to collect eggs are often not as congenial or as easily dissuaded. It helps that Guntoro has hired fishermen as patrol members. This tried-and-true local recruiting technique has been successfully practiced for many decades, since renowned herpetologist and pioneer ecologist Archie Carr first employed it in remote Costa Rican beach communities to conserve green sea turtles in the 1950s. Guntoro says he and his team have, in the end, always been able to persuade locals from taking eggs. Chester Zoo curator Gerardo Garcia says this speaks to the value of involving local people in conservation. Unfortunately for the painted terrapins, a third, even more remote, nesting beach — two hours away by boat — remains unprotected, as there isn’t enough money to hire sufficient guards. There’s no telling how many painted terrapin eggs are being poached and predated from those nests. Statistics show that the battles with boredom, boars and fishermen are paying off. Last year’s dismal 10 percent success rate seen for transported eggs, this year shot up to a 70 percent successful rate for the beachfront guarded eggs — yielding 666 hatchlings, set for release in November. The Chester Zoo’s Garcia plans to be there when those hatchlings swim free. 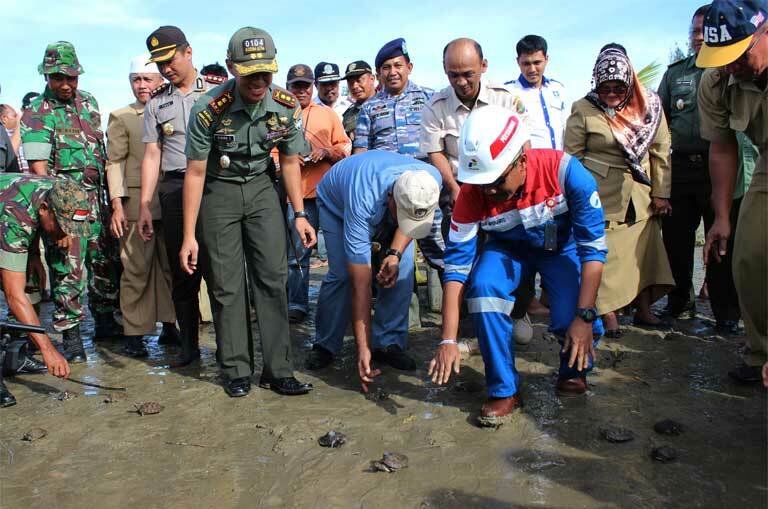 He hopes to involve Indonesian veterinary students in gathering pre-release baseline health data on the hatchlings. All the young animals will be marked, either with microchips or carapace notches. There is a lot researchers don’t know about the painted terrapin, including its underwater mating behavior and, most importantly, its patterns of migration. 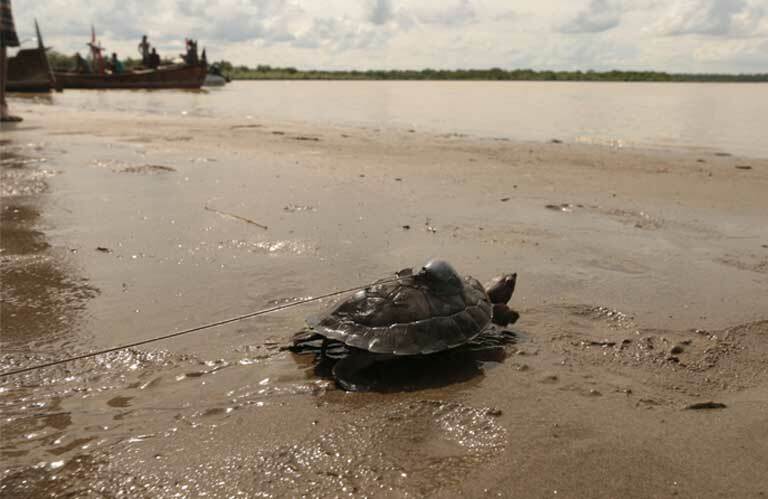 In December of last year, three hatchlings were released equipped with radio transmitters, a first for this species. Guntoro found that the animals initially traveled an impressive twelve miles away from the release site, but his team hasn’t picked up any signals since May. 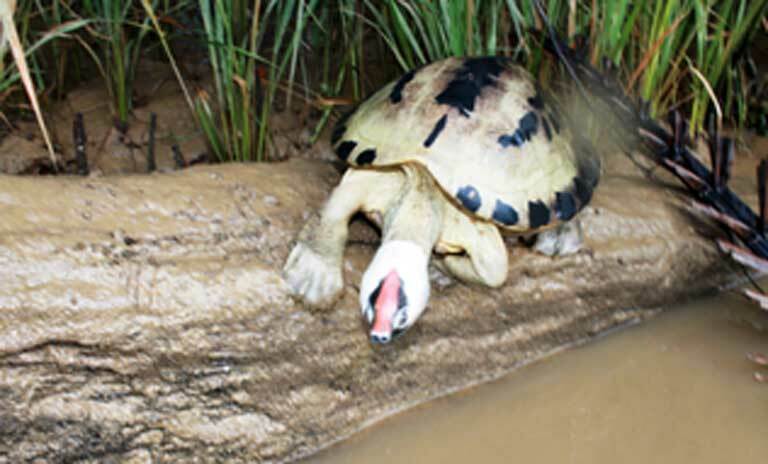 Knowing precisely where the painted terrapin is moving and living along the Tamiang River is important. 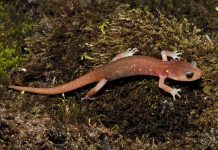 That’s because legislation, spearheaded by the Satucita Foundation, and set for a vote later this year, would designate a protected area for the species. But where exactly should that protected area be and just how big? That’s something conservationists don’t know for certain, and on which they don’t completely agree. “They can move huge distances,” says TSA’s Hudson, concerning Batagurs, the genus to which the painted terrapin belongs. And radio tracking them is notoriously difficult and time-consuming. 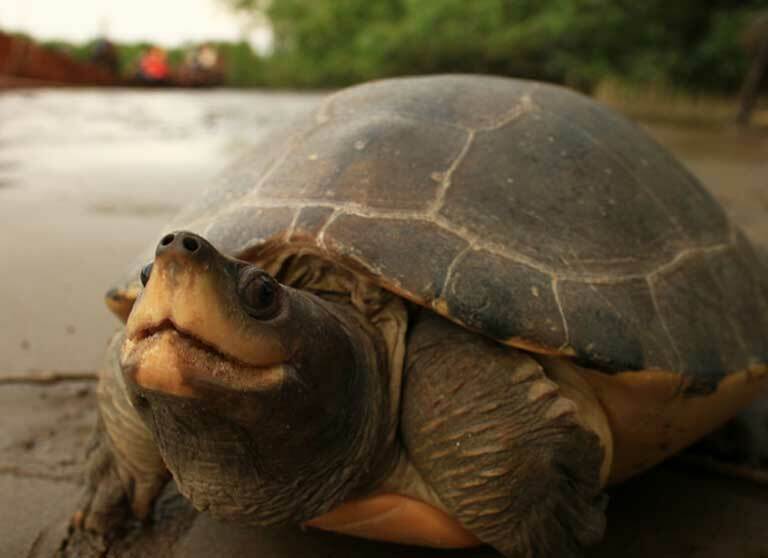 “We keep releasing river terrapins — Batagur baska, a species closely related to the painted terrapin — in India and Cambodia, that just disappear and then reappear,” Hudson relates. “Where have they been? One group in Cambodia went out to sea and ended up in another river. Everyone agrees that mapping the travel routes of the painted terrapin is critical to determining optimal conservation strategies. Hudson and Guntoro, for example, are engaged in an ongoing debate regarding the best place to release hatchlings: ocean front beaches versus river locales. The exposed ocean beaches are riskier for young terrapins, but those spots mimic the species’ natural cycle. River releases offer a better chance for survival, but may raise havoc with ocean nesting beach homing instincts — though no one knows for sure. Guntoro has so far done all his releases into river waters. But for the big release planned this fall, the conservationist isn’t putting all his terrapin eggs in one basket: the foundation will be releasing at both river and ocean locations. 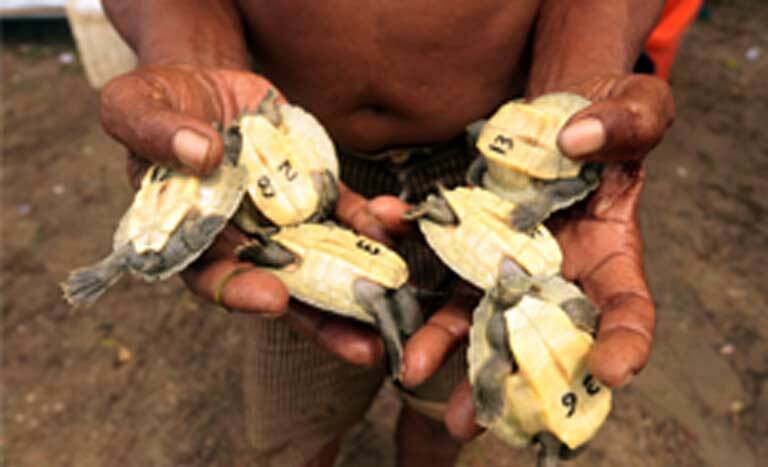 Based on the most recent nest numbers, Guntoro, who’s also the Associate Editor of the Asian Journal of Conservation Biology, estimates there are now four hundred painted terrapins in the Tamiang River. Elsewhere, in Malaysia on the Setiu River and other streams — where WWF-Malaysia has been working to conserve painted terrapins — numbers may still be viable. But Guntoro isn’t relying on other organizations and countries to save the species. As part of his effort to discourage egg collection, he’s given presentations to thousands of Indonesian students and villagers educating them about the value of the Critically Endangered species struggling to survive in their midst. 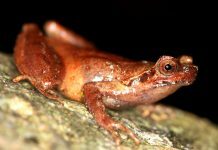 And the Indonesian government has recognized that ongoing work: Guntoro was a finalist for this year’s Kalpataru Award, given by the Ministry of Environment and Forestry. The researcher is especially looking forward to the release of those hundreds of hatchlings this November — a milestone event for his organization, and hopefully, for the future of painted terrapins in Indonesia.